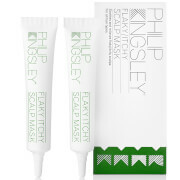 Treat your tresses to the Philip Kingsley Fabulous Foundations: Stunningly Sleek and Shiny Kit. The haircare collection combines everything you need to achieve healthy-looking locks with salon-worthy results. Suitable for damaged, dry or over-processed hair in need of strength and hydration, the luxurious pre-cleansing treatment is enriched with Olive Oil and moisturising Glycerin to add bounce to hair for luscious, healthy-looking locks. Controls frizz and flyaways and prevents further breakage of hair, whilst improving elasticity and defending against UV rays. A weightless formula that effectively cleans and moisturises from root to tip. Utilises anti-static agents to provide control and manageability, the balancing shampoo gently eliminates impurities, whilst smoothing the hair cuticle for reflective, salon-worthy shine. Ideal for dry, frizzy hair that is difficult to tame. Achieve calm, manageable locks and a frizz-free finish. Fortified with Elastin and anti-static conditioning agents to deliver intense moisture and enhance shine, whilst strengthening and smoothing strands from root to tip. Suitable for colour-treated or children's hair, the lightweight conditioner effortlessly detangles locks. A leave-in protective conditioning spray to shield hair from daily heat styling, breakage and environmental stresses. Ideal for detangling wet hair, the spray can be used on dry hair to eliminate frizz and flyaways, whilst enhancing shine. Helps to increase elasticity so you can experience healthy-looking, sleek locks from root to tip. Elasticizer: For best results use regularly. Before shampooing, wet hair and apply in sections. Work into hair with finger tips. Cover with a plastic cap and leave for 10-20 minutes before washing. Rinse well. Shampoo: Apply to wet hair and lather well with a gentle kneading of the scalp. Rinse and repeat if necessary. Conditioner: After shampooing, gently work into the hair, through mid-lengths and ends. Rinse well. Damage Defence: Shake before use. Spray throughout wet hair after using shampoo and conditioner. Leave-in formula. Comb through and use the appropriate styling products as required. Elasticizer: Aqua (Water), Ricinus Communis (Castor) Seed Oil, Glycerin, Propylene Glycol, Cetearyl Alcohol, Ethylhexyl Dimethyl PABA, Olea Europaea (Olive) Fruit Oil, Cetrimonium Chloride, Amodimethicone, Phenoxyethanol, Guar Hydroxypropyltrimonium Chloride, Ethylhexylglycerin, Hydrolyzed Elastin, Trideceth-12, Sodium Benzoate, Citric Acid. Shampoo: Aqua/Water/Eau, Sodium Laureth Sulfate, Cocamidopropyl Betaine, Cocodimonium Hydroxypropyl Hydrolyzed Wheat Protein, Sodium Chloride, Sodium Benzoate, PEG-150 Pentaerythrityl Tetrastearate, Dimethicone, Glycerin, Parfum (Fragrance), Potassium Sorbate, Coconut Acid, PEG-6 Caprylic/Capric Glycerides, Hydroxypropyl Guar Hydroxypropyltrimonium Chloride, PEG-75 Lanolin, Sodium Hydroxide, Sodium Carbonate, Citric Acid, Phenoxyethanol, Sorbic Acid. Conditioner: Aqua (Water), Cetearyl Alcohol, Amodimethicone, Cetrimonium Chloride, Phenoxyethanol, Guar Hydroxypropyltrimonium Chloride, Tridecth-12, Ethylhexylglycerin, Hydrolyzed Elastin, Parfum (Fragrance), Sodium Benzoate, Citric Acid. Damage Defence: Aqua/Water/Eau, Polysorbate 20, Parfum (Fragrance), Silicone Quarternium-16, PPG-12-PEG-50 Lanolin, Cetyl Alcohol, DMDM Hydantoin, Hydrolyzed Sweet Almond Seedcake, Citric Acid, Disodium EDTA, Quaternium-91, Undeceth-11, Cetearyl Alcohol, Panthenol, Cyclopentasiloxane, Cetrimonium Methosulfate, Behentrimonium Methosulfate, Butyloctanol, C10-40 Isoalkylamidopropylethyldimonium Ethosulfate, Cyclohexasiloxane, Undeceth-5, Hydrolyzed Elastin, Glycerin, Tribehenin, Sodium Benzoate, Phenoxyethanol, Iodopropynyl Butylcarbamate, BHT, Ethylhexylglycerin, Limonene.